At Mold Masters, it is our job and passion to minimize home water damage and the problems it causes as much as possible. It takes as little as 48 hours for mold to flourish, which is why our water damage restoration services are available 24 hours a day, seven days a week in Los Angeles, Orange County, and surrounding areas. Customer service remains our top priority so you and your family can enjoy a clean, healthy house. Call us when you need us at our toll free number and we will remove the water from your home quickly and efficiently. We get water out of your house whether your basement flooded, your upstairs toilet broke, your kitchen sink leaked into the living room, or you have any other problem that requires immediate restoration. Our Los Angeles flood damage services are among the county’s best. Never attempt to remove a serious mold infestation yourself, especially if you are dealing with the highly-toxic black mold. We have the equipment, experience, and know-how to remove mold from your home before it causes any further harm to your housing structure and the people who live in it. Our team of Orange County mold removal experts also provide mold testing to ensure your home is clear of the problematic fungus. Maintain healthy indoor air by utilizing our air quality testing services whenever you need them, such as after a flood or mold remediation process. Innumerable contaminants pollute indoor air in addition to mold and mildew, including chemical household cleaners, dust and dust mites, animal dander, insect remains, and pollen. Off-gassing chemicals such as paint and paint thinner also contribute to unhealthy indoor air. Work with our experienced team to keep the air you and your family breathe safe and healthy. 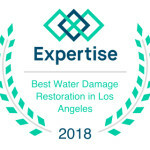 If you have recently endured flood damage, suspect mold growth, or require air quality testing in Los Angeles and its surrounding areas, give us a call today. Mold Masters will arrive at your door in a timely fashion and provide the thorough services you need to enjoy a healthy indoor environment. Our team promises a 100 percent satisfaction guarantee you want and need!